The Stanford ‘clash’ promised to be car-crash cricket. What we got was England reversing into a wall. The macabre fascination of watching players under million-dollar pressure was supposed to provide enough excitement to usher in a new era. But this 20/20 ‘showpiece’ has done nothing for the shorter game, and will drain from the American consciousness with barely a whimper. Sitting in a pub where cricket rarely ventures, a few of punters revealed to me that they “hate cricket, but this 20 million game sounds actually quite interesting”. And then the cricket started. On a lifeless pitch, unresponsive to any cash-injection, England, visibly top heavy with batsmen, donated their wickets away with carefree abandon - perhaps they weren’t so concerned about the dosh after all. The All-Stars played with a discipline and focus that too often eludes the West Indies, proving that the basics of training hard (and not wandering aimlessly across your stumps) remain essential whatever the contest. When Gayle launched his final boundary, it was genuinely warming to see the money go to the team who both deserved and needed it most. 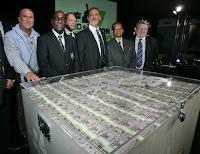 Andre Fletcher’s measured interview would have pleased Kevin Pietersen, whose concerns that such huge loot in times of recession could damage his sides image proved premature. What it all means for the wider sport remains unclear. That cricket becomes a tantalising prospect for kids growing up in the Caribbean is a fantastic legacy of this first game, but whether the ECB can hold its players back from the IPL now seems unlikely. They too, it seems were planning prematurely. There was no million-dollar moment, no nail-biting finish, no intrigue - macabre or otherwise, at all. For the All Stars young side, it was a life changing night, for England it was utterly forgettable cricket. SkyBet instructed me, every two minutes when I watched the tennis last night, that sport, apparently “matters more when there’s money on it”. That is the pillar on which the entire Stanford “ Twenty/20 for 20 ” farce is built upon. In a match bereft of any meaning, it’s hoped that injecting it with vast sums of cash will create some excitement. As Simon Barnes noted: this is not sport, this is a crass (un)reality show. For most of the millions of people who were possessed by the Wimbledon final this year, or that series in 2005, money was never a factor. Perhaps those were heady days. Now, in this absurd era of $20m matches and credit crunches, maybe our perspective cannot go further than our wallets. But when King Kev launched his frantic, chancey and breathtaking counter-attack after lunch on day five at the Oval, I doubt many were enthralled by the potential financial benefits. Great sport has a value system that translates into no other. This afternoon, the England selectors (for which read KP) announce the 15 people that are to be hired out to a Texan billionaire. For some of those this will be a life changing, bank breaking moment. For the rest of us, the ‘match’ couldn’t matter less. It should have been a fanfare, a tearful, emotionally-charged mass media farewell to one of the greatest batsmen to grace the game. But then, that was never his way. The quiet man could never quite turn up the volume. And so it is that after 25 years dominating the English game, Graeme Ashley Hick has announced his retirement. For decades, the six-and-half-foot giant plundered county attacks with a brutality that could never betray his fundamental gentleness. Instead it took the Test game - as it always does – to ruthlessly reveal his inner character. He was and remains an unnervingly popular figure. Hick never commanded adoration as, say, Flintoff does now. Instead Hick drew obsessive fans. That he could never quite understand his own failings at the highest level made him all the more interesting. Perhaps in today’s era where masculinity is more ready to embrace humanity he would have faired better. The thought of Pietersen fussing, caressing and cajoling him through the early days of his Test career can only make you wonder what could have been. Now though is not the time to dissect his Test career (again). Instead this is a personal moment for Hick and his fans. My most recent memory of Hick was a couple of years ago, when I got the chance to see him play at my club in a charity match*. Having practiced my lines and delivered them perfectly to everyone around me, I finally drew up the courage to walk up to my childhood God and tell him how much he meant to me. I tapped him on the shoulder… and absolutely panicked. My legs disappeared under me, I stuttered and stumbled and barely said a word. The great man looked at me bemused, but surely he could see a hint of what I did – a faint reflection. *In that charity game, Hick was faced with the prospect of a young girl bowling at him. As always, debilitated by his kindness he ended up lobbing a gentle catch to cover. And once again I’d seen the player I loved most fail. There is something wonderfully nostalgic about this England selection. Through my dark years of schooling England fiddled about with a series of crap selections: Mark Illott, Alan Igglesden, Simon Brown, Mike Smith etc etc… But the selection of this generously built Aussie screams one glorious name – Martin McCague. Poor Mathew Hoggard. It had to be now - this series, this game, this day. With the selectors axe dangling tantalisingly over his neck Ian Bell played the sort of innings we've been waiting for, for almost four years. His talent has never been in doubt, on song his effortless elegance is matched by no one in the England side. Test cricket though, has always demanded more than talent. Pressure is what separates the talented from the successful. Graeme Hick and Mark Ramprakash time and again battered attacks outside the heat of the Test arena, yet when the situation demanded it their minds scrambled and with it their techniques. Bell was in danger of joining this pantheon of wasted gifts. All his hundreds to date have been scored in comfortable circumstances, following on the good work of his team mates. Yesterday was different. After England's solid start, they had lost their openers and captain in a flash. With Morkel and Steyn having finally found rhythm and Pietersen floored England were staring down the barrel. For the first time in his career Bell read the situation and rose to it. He launched a counter attack that was nothing short of spectacular. It allowed Pietersen time to play himself in and set up England's day and series. Should he go on today and to make hundred it will be far and away be his best, and may prove, finally to be that elusive breakthrough innings. There are few moments like this. With half and hour to go I have retreated into myself and cannot talk to anyone. England chasing 270 in the final innings win by three wickets on the back of Michael Vaughan's 101. As England's one-day side folded all too familiarly I couldn't help but turn my attention to the upcoming Test series against South Africa. The merits of the shorter game, be it 20 or 50 overs have been trumpeted repeatedly recently. Test cricket though, especially between evenly matched teams presents a different kind of drama. Without the restrictions on bowlers, field placing and overs for batmen, Test cricket leaves players naked. Every nuance of technique and character is explored. Hoping to triumph for the first time in England since 1965 Graeme Smith brings a buoyant South African side to Lord's next month. Since re-admission South Africa have never quite managed to assert themselves on the world game. Branded chokers following habitual World Cup semi final losses they have never been a threatening force in Test cricket. Cautious at best and outright boring at worst, their cricket was too often epitomised by Jacques Kallis. Despite his impressive statistics he has never had the belief to impose himself on oppositions and turn matches. It's a negative outset that for many years held back South African cricket. But now united under a captain who demands respect without having to shout his mouth off, and free of the shackles of selection quota system, South Africa are playing vibrant cricket. Dale Steyn has added dynamism to an attack that since Allan Donald's retirement has been little more than steady. How his skiddy pace adapts to English conditions could determine the outcome of the series. When a youthful Brett Lee arrived on these shores to a similar fanfare in 2001, he was taken apart by a hopeless England side. England, following their hesitant triumph over the three-match series against New Zealand, are being brought nicely to the boil under Michael Vaughan. As always much depends on the fitness of Andrew Flintoff. If fit he lifts England's attack to another level backing up the likes of Ryan Sidebottom, Stuart Broad, Monty Panesar and Mr Mercurial James Anderson. Abandoning reason and assuming Flintoff does return he magnifies England's biggest concern - their wobbly middle order. If they take the jump and play five bowlers, one of Paul Collingwood and Ian Bell would miss out, and Tim Ambrose's runs will be closely monitored. It places huge responsibility on the top four, but you feel the aggressive approach gives England their best chance and will make for a thrilling series between two strong bowling sides. Given their recent form South Africa must start favourites, but if England's top order can conquer Steyn then the road for the Ashes may yet be paved with gold. Sport, like religion and politics rarely leaves room for consensus. One of the greatest joys for a sports fan is raging to defend your favourite player, trying to achieve the impossible task of proving that your player is better than another. Cricket, with its vast bank of statistics offers the greatest armoury for scientific proof. So when South Africa arrived in England last week with claims to having 'the best fast bowler in the world', pubs and message boards across the cricketing world erupted in debate. Dale Steyn is the name that will dominate the England team talks and who Graeme Smith's team will be hoping can prove the difference between the two sides over the next few weeks. With pace, late swing and a menacing glare he has had a phenomenal year yielding 78 thrilling wickets in 12 games at 16.24. The statistics indicate a bowler in the form of his life. Interestingly, the last time these two sides met it was England who had the pace sensation. Somebody called Steve Harmison had just completed a barnstorming year, prompting Stephen Fleming to hail him as "a more dynamic, threatening version of Glenn McGrath". Harmison went on to take only nine expensive wickets in the five-game series. His career has never really recovered and it will be a surprise to see him at all this summer. This demonstrates, as if we didn't know it already, the futile nature of predictions in sport. Unlike almost no other in the game, the sight of a fast bowler steaming in intimidating batsmen is truly exhilarating. Alongside all the technical skills, fast bowlers need presence - a personality that crushes batsmen as much as a searing yorker. Curtly Ambrose barely had to whisper a word, but his was a chilling presence that many could never overcome - just ask Graeme Hick. With too much one-day cricket on too many flat pitches, today's crop seem a tamer bunch. Pleasingly, there are a number of promising youngsters around the world, but they still have plenty to prove. Following Steyn in the ICC rankings are the Australian pair Stuart Clark and Brett Lee. Despite lagging far behind in the rankings, Andrew Flintoff's early season barrage moved Justin Langer to declare him the very best fast bowler around. Until Fred can actually get on the field for England, however, we'll have to forget about him. Lee is now the complete package. Handed the mantle of leading Australia's attack following McGrath's retirement, he has transformed himself and bowled with hostility, accuracy and a guile that Steyn can yet only dream of. Added to his remarkable talent is a heart and enthusiasm which would fuel him through a brick wall. In an age where sporting spirit is continually undermined, Lee has lit up grounds and newspapers with his Colgate smile and vibrant personality. Statistics can always tell a story, and leading an inexperienced attack against good batting sides, he has taken 58 wickets in nine games over the last year at 21.55. With his stealth like new-ball partner Stuart Clark, he is hoping to carry Australia into the next generation. There's no column in the scorebook for it, but inspiration here would be the mark of a truly great fast bowler. As ever the facts can't reveal the entire truth. But that's just my opinion.